The ON Chenecks goalkeeper was sent off after this incident involving Peterborough Northern Star's James Hill-Seekings (stripes). Photo: Chantell McDonald. @cmcdphotos. Free-scoring title contenders Wisbech Town and Yaxley are set for a United Counties Premier Division shootout at the Fenland Stadium on Tuesday (February 13). Table-toppers Yaxley and third-placed Wisbech both romped to 6-0 wins yesterday (February 10) to keep up the relentless pace at the top. Second-placed Newport Pagnell also enjoyed a six-goal winning spree which was bad news for fourth-placed Holbeach United who were held at home and for fifth-placed Deeping Rangers whose scheduled contest at home to Eynesbury was postponed because of an icy pitch. Jake Sansby scores from the penalty spot for Peterborough Northern Star against ON Chenecks. Photo: Chantelle McDonald. @cmcdphotos. Ross Watson claimed a hat-trick for Yaxley and Michael Frew did likewise for Wisbech. Yaxley are four points clear of the Fenmen, but they have played three more games. Holbeach dropped two points after an incident-packed contest with Wellingborough Town at Carter’s Park. Things looked good for Holbeach when Danny Brooks fired them in front just before the hour mark against a team reduced to 10 men in the first-half. But Ash Jackson conceded a penalty which was converted 20 minutes from time before Tigers’ man Matt Warfield picked up a late red card. Peterborough Northern Star were also undone by 10 men. The ON Chenecks’ keeper was sent off on 70 minutes at the Branch Brothers stadium for an alleged punch and Jake Sansby took advantage to make it 2-2 from the spot. Wayne Morris of Peterborough Northern Star (stripes) celebrates his goal against ON Chenecks. Photo: Chantelle McDonald. @cmcdphotos. But the visitors went straight up the other end to re-take the lead and held on to take the three points. Wayne Morris had earlier scored for Star. In Division One leaders Pinchbeck United saw their game at bottom club Stewart & Lloyds postponed enabling Raunds to cut the gap at the top to seven points with a thrilling come-from-behind win at Bourne. 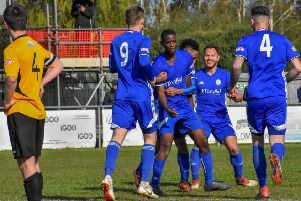 Goals from Adam Rothery, Zak Munton and Dan Schiavi, a midfielder recruited from Deeping the day before, saw Bourne into a 3-1 lead, but Raunds hit back, eventually winning the game with three goals in the last 11 minutes. Blackstones also left it late at Huntingdon where co-boss Lee Clarke struck the decisive goal in a 2-1 success in the 90th minute. Jones De Sousa had opened the scoring for Stones in the early stages. The Division One derby in the Thurlow Nunn Eastern Counties League between Wisbech St Mary and March Town United finished all square at 2-2. Casey Logan and Adam Conyard scored for March. Premier Division: Holbeach United 1 (Brooks), Wellingborough Town 1; Peterborough Northern Star 2 (Morris, Sansby), Northampton ON Chenecks 3; Wisbech Town 6 (Frew 3, Bunting, Smith, og), Rothwell Corinthians 0; Yaxley 6 (Watson 3, Waumsley 2, Butterworth), Oadby Town 0. Division One: Huntingdon Town 1, Blackstones 2 (Da Sousa, Clarke); Raunds Town 5, Bourne Town 3 (Rothery, Munton, Schiavi). Postponed: Stewart & Lloyds v Pinchbeck United. Division One: Wisbech St Mary 2, March Town United 2 (A. Conyard, Logan).